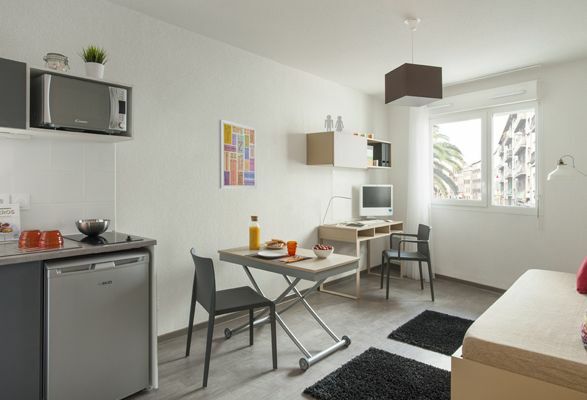 Student Apartment Marseille ⇒ 10 min walk from "La Timone"
10 minutes from the La Timone student campus. At the very heart of Marseille's 5th district, the Carré Saint-Pierre residence is in close proximity to metro line 1 and tram line 1. It is nearby La Timone campus but also offers easy access to the city centre (thanks to the metro) making it simple for students to reach the city’s universities and higher education institutions. A “broadband” internet connection will be available throughout the residence for all devices. 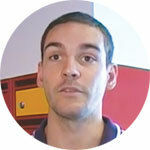 Lorenzo TRAGLIA is your superintendent at the residence Carré Saint-Pierre. Your residence includes an equipped laundry room. You can pay by credit card. The presence of a residence manager reassures me, we can always count on her. I was immediately seduced by the Victorian Park residence: the interior garden, the apartments with mezzanine and the great location, close to the universities. On my first visit, I knew that’s where I wanted to live. 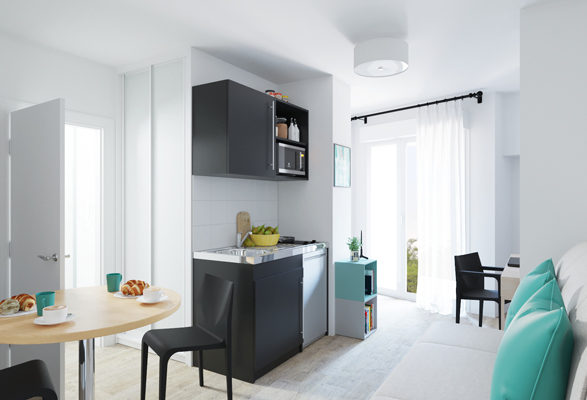 At the very centre of a lively district, between the hustle and bustle of the most popular neighbourhoods and the tranquillity of more residential areas, our studios in the Carré Saint-Pierre residence offer students a modern and comfortable place to live. At the very heart of Marseille's 5th district, the Carré Saint-Pierre residence offers contemporary two-br apartments. Made up of a main living space with equipped kitchenette, bedroom and washroom, they have a practical and optimised layout which makes the most of all available space. To make student life that bit easier, this accommodation includes all necessary furniture. 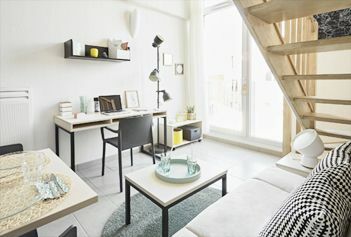 The apartments come equipped with a pull-out bed, desk, storage furniture and adjustable-height table, which have all been chosen for their design and functionality. As an ideal way to make the most of additional space, the two-br apartments are also suitable for two to share. (1) T1, residences measuring less than 26 m2. T2, residences measuring less than 39 m2. T3, residences measuring less than 52 m2. (3) Prices from. The utility charges include cold water, hot water, internet access and gym access. *Reservation fees offered for any new lease signed before 30/04/2019.